The unusual arrangement of the floral marquetry veneers on this bureau-cabinet attest to the early interest in re-using old veneers. 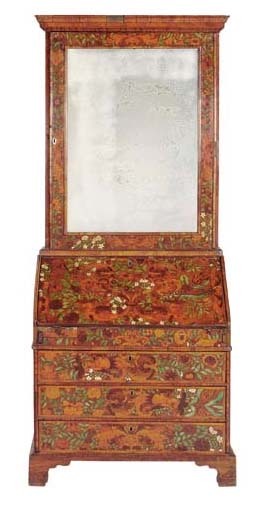 This antiquarianism was displayed by collectors such as Brownlow (d. 1793), 9th Earl of Exeter, who was invoiced by the Golden Square cabinet-makers Mayhew and Ince on 27 August 1767 for 'Entirely new working, some old inlaid work, making good the defficiencys [sic], and making up the same, into 2 commodes' (O. Impey, Four Centuries of Decorative Arts from Burghley House, Alexandria, Virginia, 1998, p. 54, fig. 26).